Background: Sarcomatoid carcinoma of the lung is a rare tumour with a poor prognosis. Observation: We present a case report of sarcomatoid carcinoma and its mode of presentation with a complete illustration. In this case, the tumour, which is generally peripheral, was proximal and was revealed by non-specific symptoms and radiological features suggesting a thromboembolic disease. 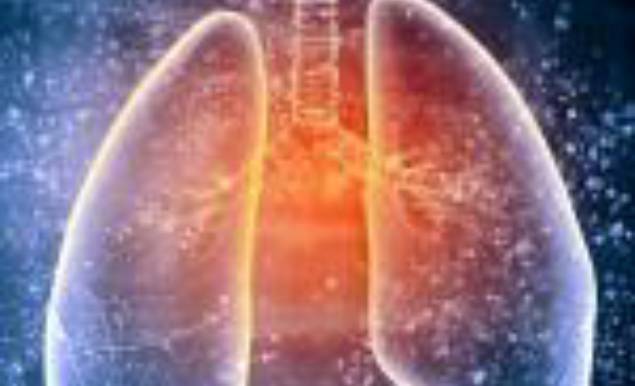 Conclusion: This observation is interesting because it highlights the necessity of evoking the diagnosis of lung carcinoma when dealing with radiologic features related to a thromboembolic disease. Sarcomatoid carcinoma, thromboembolic disease, pathology. A 68-year-old man, 80 pack-year smoker, consulted for a 4-month-lasting effort dyspnea of New York Heart Association (NYHA) functional class II and dry cough. Physical examination revealed a grade III/IV ejection systolic murmur in the aortic area. 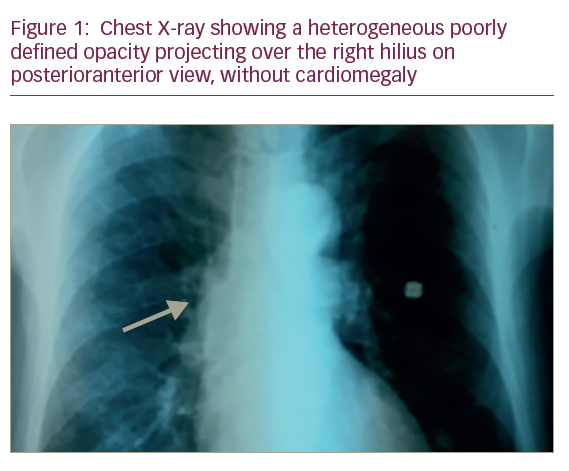 Chest X-ray showed a heterogeneous poorly defined opacity of the right hilius without cardiomegaly (Figure 1). Electrocardiogram showed a regular sinusoidal rhythm and a tachycardia at 100 beats/min without signs of left ventricular hypertrophy. A two-dimensional (2D) transthoracic echocardiography (TTE) showed a severe aortic stenosis. The left ventricular ejection fraction was estimated to 70%. There was no pulmonary arterial hypertension. The pulmonary artery systolic pressure was estimated to 30 mm Hg. 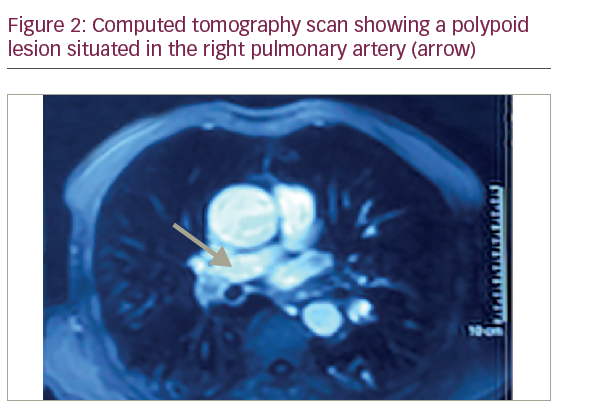 A computed tomography (CT) scan revealed a thrombus in the lower branch of the right pulmonary artery of tumoural appearance extending to the right lower lobe artery (Figure 2). Bronchial fibroscopy was normal. No distant metastasis was revealed by the cerebral CT scan or the abdominal CT scan. The lung function was within normal values. Surgical resection of the arterial process and aortic replacement was decided. Surgical resection was performed through a median vertical sternotomy. The procedure consisted of a right intra pericardial pneumonectomy with aortic valve replacement by a mechanical valve. A mediastinal lymph node dissection was also performed. Postoperative macroscopic examination of the resected specimen showed a 2 cm tumour encompassing the pulmonary artery and developing into the sub-intima without endoluminal component (Figure 3A). The extemporaneous exam concluded to a sarcomatous tumour. Definitive microscopic findings consisted in a malignant proliferation with wide necrosis composed of tumour cells of variable size with abundant eosinophilic cytoplasm and atypical nuclei. Some tumour cells were multinucleated (Figure 3B). Immunohistochemical study revealed the co-expression of cytokeratin and vimentin antibodies by the tumour cells (Figure 3C and D). Other antibodies including anti-smooth muscle actin and desmin weren’t expressed, ruling out the diagnosis of a muscle differentiated tumour. The mediastinal lymph nodes dissected were benign. These morphological and immunohistochemical features were consistent with a primary sarcomatoid carcinoma of the lung invading the pulmonary artery classified as a pT1N0M0 tumour. Molecular studies highlighted no epidermal growth factor receptor (EGFR), Her mutations, anaplastic lymphoma kinase (ALK) translocation or c-met amplification. followed by the oncologist, and after 4 months of follow-up, presented no complications. 1. Roberts TE, Hasleton PS, Musgrove C, et al., Vascular invasion in non-small cell lung carcinoma, J Clin Pathol, 1992;45:591–3. 2. Kharwar RB, Sharma A, Sethi R, et al., Pulmonary Artery Stenosis due to Lung Carcinoma: A Rare Cause of Dyspnea, J Cardiovasc Ultrasound, 2014;22:209–12. 3. Millet A, Morel H, Sanchez O, et al., Invasion of the pulmonary artery by an undifferentiated carcinoma, Rev Mal Respir, 2008;25:63–7. 4. Jaffery Z1, Ananthasubramaniam K, Isolated left pulmonary artery stenosis due to extrinsic compression by intra thoracic tumor: recognition of unusual Doppler flow pattern and correlation with computed tomography, Int J Cardiovasc Imaging, 2007;23:507–10. 5. Plasencia-Martínez JM, Carmona-Bayonas A, Calvo-Temprano D, Jiménez-Fonseca P, Prognostic value of computed tomography in acute pulmonary thromboembolism [article in Spanish], Radiologia, 2016;1: Online first. DOI: 10.1016/j.rx.2016.06.011. 6. 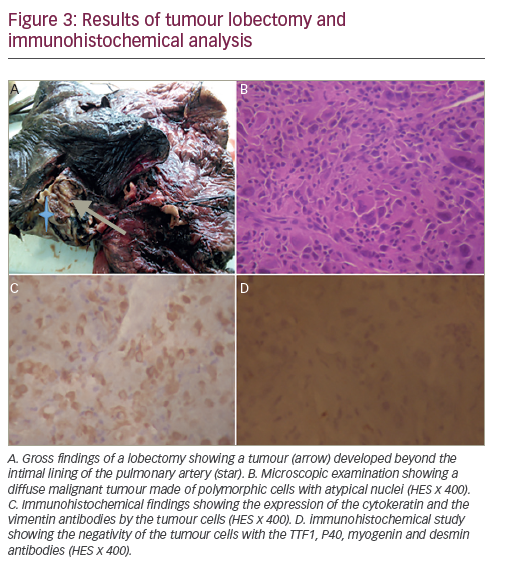 Szkorupa M, Bohanes T, Neoral C, et al., Sarcomatoid carcinoma of the lung. A case report, Klin Onkol, 2015;28:57–60. 7. Raveglia F, Mezzetti M, Panigalli T, et al., Personal experience in surgical management of pulmonary pleomorphic carcinoma, Ann Thorac Surg, 2004;78:1742–7. 8. Vieira T, Antoine M, Ruppert AM, et al., Blood vessel invasion is a major feature and a factor of poor prognosis in sarcomatoid carcinoma of the lung,Lung Cancer, 2014;85:276–81. 9. Yamaguchi T, Suzuki K, Asamura H, et al., Lung carcinoma with polypoid growth in the main pulmonary artery: report of two cases, Jpn J Clin Oncol, 2000;30:358–61.